COMPOSITION Polyvinyl acetate dispersion, water, special additives. STORAGE AND TRANSPORTATION Store in a tightly closed container at a temperature of at least + 5 ° C. Withstands no more than 5 cycles of freezing-thawing. Thaw the glue at room temperature for 24 hours. After defrosting, the adhesive completely restores its properties. 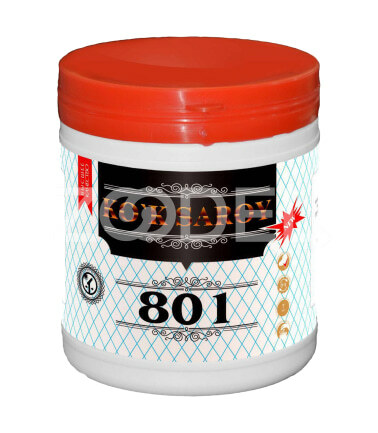 Empty containers and residues of dried glue should be disposed of as household waste. During transportation, the container must be fixed in an upright position. The transportation time at a temperature of -40 ° C is not more than 30 days. The warranty period of storage in an unopened container is 12 months from the date of manufacture (date of production see on the packaging). PRECAUTIONARY MEASURES The glue is fire and explosion proof. Do not mix with other types of adhesives, thinners and solvents. When applying, wear personal respiratory protection (respirators), hands (gloves) and eyes (glasses). In case of contact with eyes, rinse immediately with plenty of water. Keep out of the reach of children. MODE OF APPLICATION Stir the glue thoroughly before use. Apply on a single or both glued surfaces with a brush, plastic spatula or roller in a thin layer at a temperature of at least + 8 ° C and a relative humidity of not more than 80%. Surfaces are tightly connected and maintained under pressure, if necessary, fixed. The product should be used after full drying, but not earlier than 24 hours. In the cement mortar, the adhesive should be added only after preliminary dilution with water in a ratio of at least 200 g of glue per 10 liters of water. Immediately after the work is finished, the remnants of the adhesive from the contaminated coatings, tools and containers should be removed with water and household detergents added. SURFACE PREPARATION The surface must be thoroughly cleaned from fragile and crumbling coatings, be dry, clean, free from grease. One of the surfaces must be porous and absorb the glue. Glue PVA 801 Ko`k Saroy is designed for gluing surfaces that withstand high operational loads: paper, cardboard, wood, wallpaper and linoleum on a pile basis on wooden, concrete, plastered, trowelled and other porous surfaces indoors. Adhesive is used to add to mortars, when laying ceramic tiles, making floor screeds. Company Name OOO "Namangan Porloq Ta`mirlash Servis"
Packaging Details In each package of 12 pcs.